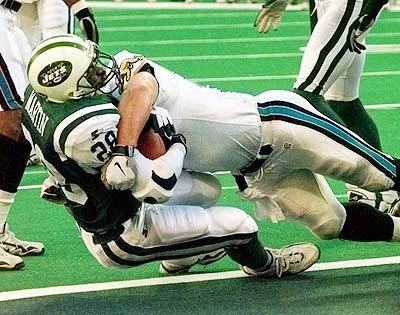 The New York Jets were in the postseason for the first time in seven years as they hosted the Jacksonville Jaguars in an AFC Divisional Playoff game on January 10, 1999. Head Coach Bill Parcells, formerly of the Giants and Patriots, had guided the Jets to a remarkable turnaround, just two seasons removed from a dreadful 1-15 record. Newcomers had made a difference in ’98, with QB Vinny Testaverde (pictured above), a career underachiever, putting together a Pro Bowl season and RB Curtis Martin, formerly with Parcells in New England, rushing for 1287 yards and also gaining a Pro Bowl spot. Another Pro Bowler was WR Keyshawn Johnson, stepping up his game in his third season in New York (83 catches, 1131 yards, 10 TDs). The defense was especially strong at linebacker, where yet another newcomer, Bryan Cox, performed well in a unit that already included All-Pro OLB Mo Lewis. The Jets won their last six regular season games on the way to a 12-4 record that topped the NFC East. The Jaguars, only a fourth-year franchise coached by Tom Coughlin, were nevertheless in the playoffs for the third consecutive season, having topped the AFC Central at 11-5. The offense was potent, led by QB Mark Brunell, who missed three weeks late in the season with an ankle injury. Wide receivers Jimmy Smith and Keenan McCardell made for a productive tandem and rookie RB Fred Taylor rushed for 1223 yards and 14 touchdowns. The defense was far less impressive, however, ranking a mediocre 25th in the league and particularly lacking a pass rush. Jacksonville defeated the Patriots, who were without their starting quarterback, in the Wild Card playoff round to advance to the Divisional game against the Jets. There were 78,817 fans in attendance at Giants Stadium in the New Jersey Meadowlands. The Jets had the first possession and drove 70 yards in seven plays. Curtis Martin started it off with a 17-yard gain on a pass play and rushed for 11 yards while Vinny Testaverde had three more completions, the last two to RB Dave Meggett for 14 yards and Keyshawn Johnson (pictured below) for a 21-yard touchdown. John Hall added the extra point. The teams exchanged punts, with the Jaguars advancing to the New York 42 on their second possession. Mark Brunell completed three passes, two of them to Keenan McCardell, but his last two fell incomplete, forcing another punt. The Jets took over at their seven and, in a series that extended into the second quarter, drove into Jacksonville territory. Testaverde was successful on four of his throws, one of which had 15 yards tacked on for an unsportsmanlike conduct penalty, and after the drive stalled at the 34, Hall kicked a 52-yard field goal to open up a 10-0 lead for New York. The Jaguars no sooner got the ball back following the kickoff when Brunell threw a pass that was intercepted by CB Otis Smith at the New York 40. A long possession with an odd play in the midst of it ensued. With the Jets at the Jacksonville 18, Martin fumbled and FS Chris Hudson recovered and raced 47 yards down the sideline. However, an attempt to lateral to CB Dave Thomas failed and Keyshawn Johnson recovered the loose ball. Given a reprieve, the Jets drove 65 yards back into Jacksonville territory and, on an end-around, Johnson ran around left end for a ten-yard TD. With Hall’s point after, the New York lead was up to 17-0 with 40 seconds remaining in the first half. It was enough time for the Jaguars, following a 28-yard kickoff return by WR Reggie Barlow. Three plays later, Brunell threw long to Jimmy Smith (pictured at left), who took advantage of a lapse in coverage for a 52-yard touchdown. Mike Hollis converted and the score stood at 17-7 at halftime. Jacksonville appeared to maintain the momentum heading into the first series of the third quarter, but facing a third-and-inches situation at their 49, Brunell threw a long pass that was picked off by FS Corwin Brown, who returned it 40 yards to the Jacksonville 40. Testaverde completed passes to Martin for 16 yards and Johnson for 23 to reach the one yard line, and three plays later Martin scored a TD that, followed by Hall’s PAT, again gave the Jets a 17-point lead at 24-7. The Jaguars weren’t finished yet, and Barlow returned the ensuing kickoff 88 yards to the New York four. The Jets held for three downs, but on fourth-and-three, Brunell completed a pass to McCardell for a touchdown. Hollis added the extra point to reduce the New York lead to 24-14. The Jets responded with a series in which Testaverde completed all five of his passes. WR Wayne Chrebet hauled in the first for 16 yards, Martin had catches for nine and ten yards, and in between WR Dedric Ward had an 18-yard reception. TE Kyle Brady’s catch for 17 yards put the ball at the Jacksonville four, and two carries by Martin yielded a one-yard TD. Hall kicked the point after and the home team took a 31-14 lead into the fourth quarter. Following a punt by the Jets early in the final period, Fred Taylor took off on a 29-yard run that launched a 64-yard drive. Brunell threw to Jimmy Smith for a 19-yard TD and Hollis converted to make the score 31-21. On the third play of their next possession, the Jets turned the ball over when Chrebet fumbled when hit by LB Kevin Hardy and Dave Thomas recovered for the Jaguars at the New York 41. It appeared that the break would come to nothing when the visitors couldn’t move the ball and a fourth-and-nine pass fell incomplete, but the Jets were called for pass interference. Jacksonville still couldn’t get a first down, reaching the New York 19, but Hall kicked a 37-yard field goal to make it a seven-point game with 6:38 to play in regulation. 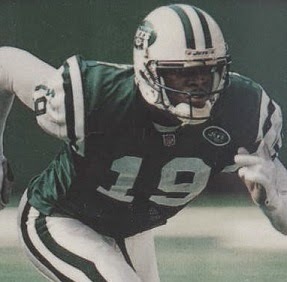 The Jets fought back, converting a third-and 14 situation at their own 30 with Testaverde connecting with Johnson for a 20-yard gain. Martin ran effectively, but after advancing to the Jacksonville 14, Testaverde’s pass was intercepted by SS Donovin Darius. Darius, who slid down in the end zone after making the catch, was slow to get to his feet and, rather than taking a touchback, tried to run and barely made it out of the end zone before being tackled. The Jaguars thus were forced to start from their one yard line. Brunell had a seven-yard run on second down, but his three passes fell incomplete, including the last on fourth-and-three at his eight at the two minute mark. Hall kicked a 30-yard field goal to effectively seal the 34-24 win for New York, with the home crowd erupting loudly at the end. The win was New York’s first in 12 years in the postseason. The Jets significantly led in total yards (429 to 251) and first downs (29 to 14). Jacksonville turned the ball over four times, to three suffered by New York, but the Jaguars had the game’s only two sacks. 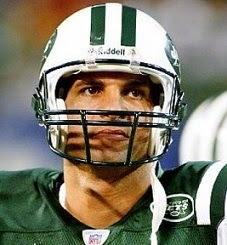 Vinny Testaverde completed 24 of 36 passes for 284 yards and a touchdown while giving up one interception. Curtis Martin (pictured below) rushed for 124 yards on 36 carries that included two TDs and also caught 6 passes for another 58 yards. Keyshawn Johnson had 9 catches for 121 yards and a touchdown, ran the ball twice for 28 yards and another score, and also recovered a fumble and, inserted as an extra defender, intercepted a desperation pass at the end of the game. The overall performance made him the second player in NFL postseason history to score on both a catch and a run, recover a fumble, and intercept a pass in the same playoff game (Jack Manders of the Bears did the same thing in the 1937 NFL Championship game). For the Jaguars, Mark Brunell was successful on 12 of 31 throws for 156 yards and three TDs, but also was intercepted three times. 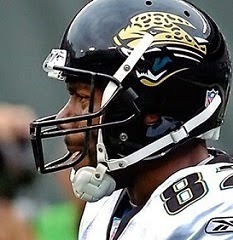 Fred Taylor gained 86 yards on 20 rushing attempts. Jimmy Smith caught 5 passes for 104 yards and two touchdowns and Keenan McCardell contributed four receptions for 32 yards and a TD. On defense, Kevin Hardy had a noteworthy performance, compiling 19 tackles, 14 of them solo. “It wasn’t an aesthetic performance in a lot of ways, but this is a good win for this franchise,” said Coach Parcells of the Jets. “We made foolish, foolish plays, foolish throws, foolish decisions,” summed up Mark Brunell of his team’s performance. The Jets moved on to the AFC Championship game at Denver and lost convincingly to the powerful Broncos. Jacksonville came back in 1999 with a NFL-best 14-2 record and reached the AFC title game before losing to Tennessee.